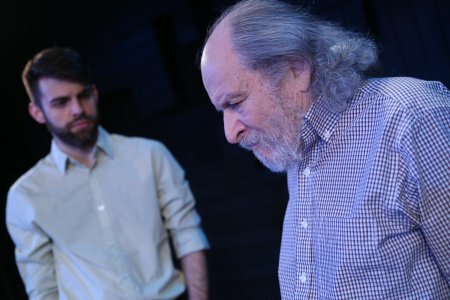 “…it doesn’t help anything to say things like these are strange times,” a weary, bearded, old Jewish man says to the audience about recent odd occurrences at the beginning of Silver Men by Amy Fox. It is one of the five high quality one-act works in Ensemble Studio Theatre’s 35th Marathon of New One-Act Plays: Series A. “There was the time my son Jeffrey started buying pink things,” the old man recounts of his middle-aged son’s increasingly bizarre behavior that culminates in painting a barn pink. That the old man is played by David Margulies instantly is cause for joy. This supreme stage veteran has also appeared in many films during his long career. His is a welcome and strong presence as this ruminative character. Ms. Fox has written a haunting, elegiac, and mystical family drama with dashes of mordant Jewish wit. 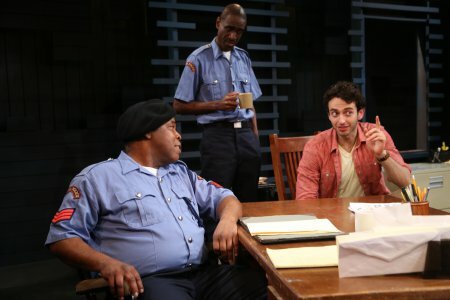 The expert placement of the three actors and their moving performances are evidence of Matt Dickson’s finely realized direction on the relatively bare, small stage. Tommy Heleringer is intense and charming as the grandson. Catherine Curtin wistfully makes a great impact in the brief role of the daughter-in-law. Without dialogue and with great charisma, Kit Treece, appears as the man, and the two passionately dance together. Ms. MacCarthy’s taut writing is enhanced by the tight direction and expressive choreography of Sidney Erik Wright. The combination of all these elements, with added lighting effects, and well-selected, moody jazz music, all make for a riveting psychological thriller. 52nd To Bowery To Cobble Hill, In Brooklyn is Chiara Atik’s hilarious and poignant play about two 20’s career women sharing a NYC taxi comedy. After attending a gathering of friends, the honest feelings of the two acquaintances are revealed. Molly Carden is a riot as the loquacious one, and Megan Tusing as the more subdued one, offers a wonderful portrait of seething restraint that erupts. Ms. Atik’s writing is filled with realistically comical touches. One works in “tech,” the sound of a News 4 New York broadcast, and bickering over the route with the driver. The measured direction Adrienne Campbell-Holt infuses it with more depth, elevating it beyond being a mere sketch. “How’s my brother Obama? I hate The Republicans!” roars the rural Kenyan police chief to a young American white male in Will Snider’s contemporary political satire, The Big Man. The American is at the station house to get back his towed car. It’s a slim but entertaining clash of foreign idealism versus native pragmatism tale. As the wily sergeant, Ray Anthony Thomas is effortlessly commanding, getting every laugh there is, as well as conveying a ruthless outlook. Gianmarco Soresi adds range and substance to the role of the wound-up American, with his charmingly animated performance. Brian D. Coats slyly makes the most of the yes man police subordinate, with his delightfully dry delivery. 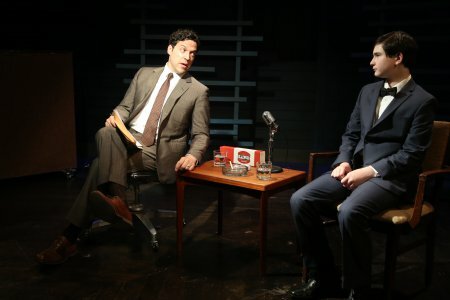 Aaron Serotsky’s terrific performance as Mike Wallace is the highlight of I Battled Lenny Ross, a musical memory piece drama about a 1950’s television quiz show child genius. In 1958, 12-year-old Lenny who won $100,000 on a quiz show is being interviewed sometime after on Wallace’s show. Anna Ziegler’s detailed book is packed with drama, and Matt Schatz’s music and lyrics are accomplished, but it plays as too truncated and complicated to be totally satisfying during the short running time. There are flashbacks from the future, and several other characters and scenes outside of the studio. As a work in progress for possible expansion it has possibilities. Young Jake Kitchin winningly plays the troubled savant. Olli Hasskivin and Julie Fitzpatrick skillfully portray his parents as well as others. Under the time constraints, director Daniella Topol has deftly staged all of the action and temporal elements as well as possible. Scenic designer Nick Francone’s settings range from simple to relatively elaborate especially for the police chief’s office in The Big Man. All of these creations artfully convey the sense of place, and are swiftly able to be reset from one play to another. The many moods and locations of the five plays are evocatively realized by the Greg MacPherson’s striking lighting design. The 14 diverse characters are realistically represented by Audrey Nauman’s inspired costume design. 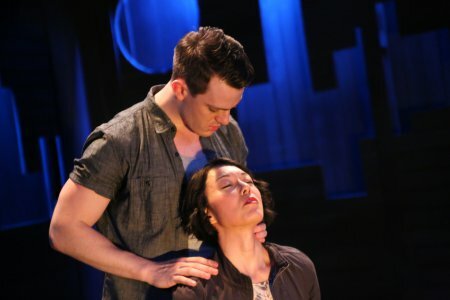 Sound designer Julian Evans and music director Assaf Gleizner’s aesthetic contributions includes the chilling effects for Until She Claws Her Way Out, as well as the engaging transitional music between each play. Founded in 1968, this theater company is, “…committed to the discovery and nurturing of new voices, and the continued support and growth of artists throughout their creative lives.” Ensemble Studio Theatre’s 35th Marathon of New One-Act Plays: Series A fulfills this noble goal with its enticing and often quite remarkable variety of works. Series B and Series C will follow and all will run through several dates in June. An excellent cast led by Linda Lavin as a troubled actress visiting her estranged daughter performs in this rich play filled with surprises. An idealistic artist clashes with P.T. Barnum in this spirited musical. It’s 19th century Americana with flashes of Mark Twain that’s joyously presented.